Community Financial is excited for our first year in partnership with Grand River Academy in Livonia! Partnering with Grand River Academy marked Community Financial’s 50th Student-Run Credit Union! Our Student-Run Credit Union program provides students with a fun way to learn real-life skills. Each student who would like to volunteer to work at the Student-Run Credit Union will go through an interviewing process similar to what adults experience. Grand River Academy’s fifth and seventh grade students recently learned how the interviewing process works. 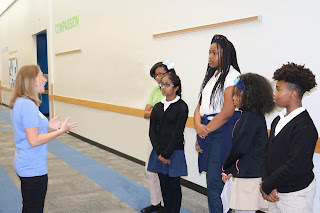 student hires on how to conduct themselves in an interview setting. Students who apply to volunteer at the Student-Run Credit Union go through a “best fit” interview. Students are then hired as branch managers, tellers, accountants, computer operators, and marketing representatives. On their application, students must choose three jobs that they believe they are the most qualified for. During the interview, Community Financial team members ask questions to help determine which job best fits the student’s skills and interests. Check out these pictures of students participating in the interview process for the Student-Run Credit Union. Taking the Stress Out of the Interviewing Process! Most students are very nervous coming into the interview. However, the most common feedback we hear from students after the interview is: “It wasn’t as scary as I thought it would be!” This is the precise reason we want to give students the opportunity to practice interviewing skills. When you break it down, an interview is just a conversation with another person. Before an interview, students are encouraged to practice conversing with others about why they think they would be the best fit for the job they’re applying for. Practicing interviewing skills is incredibly important to alleviating stress during an interview. Your Turn: How do you prepare for an interview? Share your tips and tricks for success!